Microsoft Outlook is one of the major email client applications used globally. The reputation of Outlook can be mainly attributed to its easy-to-use graphical interface and up-to-date security enhancements. The connectivity with the other advanced technologies makes Microsoft Outlook stand out in the crowd from several other email clients. But the ease and complexity are indirectly proportional to each other in the technological fields. With the ease, there must also be some associated complexity. The management of multiple Outlook data files is really tough. But the situation becomes worse when we have Outlook PST files in bulk. Then we have to figure out how to manage the Outlook PST files without losing any data. To completely address this problem, in this article, we are going to discuss the easy-to-use manual method to combine multiple PST files in Outlook 2016, 2013, 2010, 2007, and so on. The merging of Outlook PST files with the manual solution is really tough and complex, requiring technical expertise. However, a complete guide to combine Outlook PST files with attachments in a simple manner is given below. 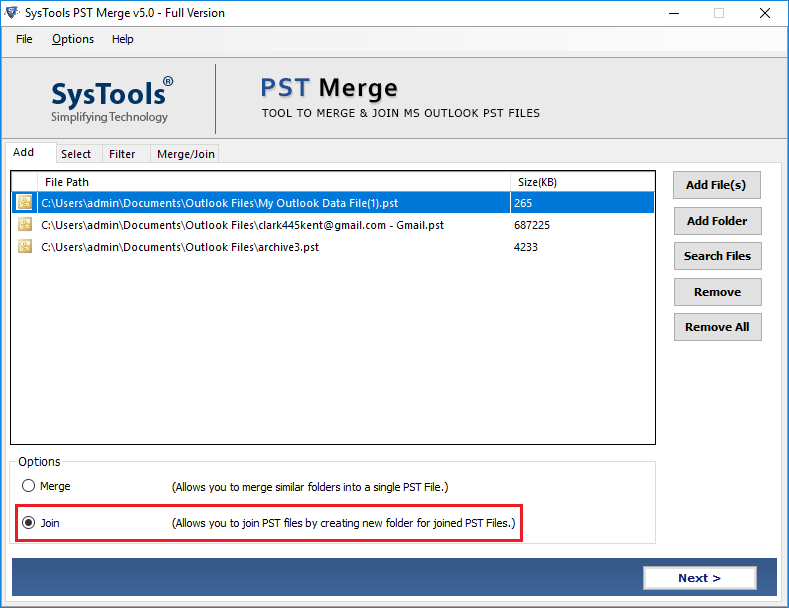 There are two different steps involved in merging PST files in Outlook 2016 and 2013. The simple and easy-to-use manual guide to create a new blank Outlook PST file is given below. Select the location to save a new blank Outlook PST file and named it as you wish. This is the final step, after which the merging of Outlook data files will be completed successfully. Follow these steps to merge multiple PST files in Outlook 2016, 2013, 2010, and 2007. Start and run Microsoft Outlook and then go to File >> Open >> Import option. The Import/Export wizard opens up next. Select the option to import from another program or file option and click on the Next button. Select the option Outlook Data File to import that file type. Click on the browse button in order to select the file to import. Then in the next step, you will get the option to not import duplicates to eliminate the possibility of the removal of duplicate items. Click on the Next button. Select the folder that you wish to import. Check on the include sub-folder and import items into the same folder in options. After following the above-mentioned steps, you are able to combine multiple PST files in Outlook 2016, 2013, 2010, 2007, and so on. The same must be repeated for each Outlook PST file that you have. Now, we will discuss the instant solution to easily combine PST files into one in Outlook 2013, 2013, 2010, 2007, and so on. 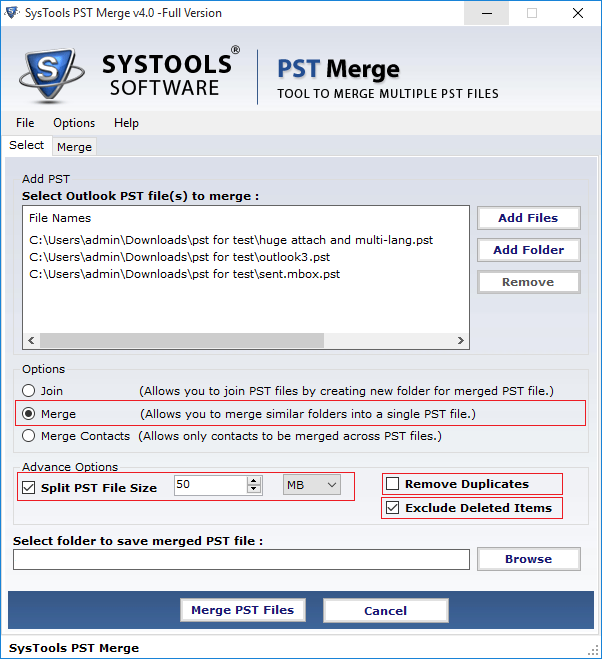 Download and install PST Merge Software. Click on an add file option; select the option which is feasible for you. Select from the multiple options to merge Outlook data files such as Merge, Join, and Merge Contacts only. Please apply the filter as per requirement. By default, you will get the option to remove duplicates, exclude or include deleted items, or split an Outlook data file. Browse for a location to save the resultant Outlook data after the completion of the merging process. Finally, click on the Merge PST files option to start the process. So far, we have discussed how to merge Outlook data files into single Outlook PST files using two approaches. One is the manual solution, and the second is the SysTools PST merge software, through which we can easily combine multiple PST files in Outlook 2016, 2013, 2010, 2007, and so on. The second approach is recommended over the first one. 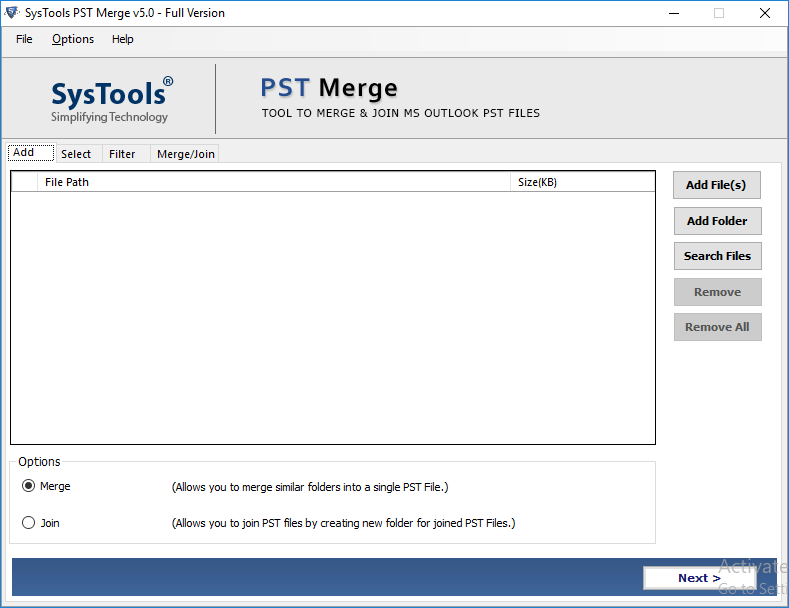 As with the PST file merge software, you get the safe and secure mechanism to merge PST files in Outlook 2016, 2013, and 2010. Top 3 options to merge Outlook data files. We have discussed the two different approaches to merge Outlook data files with attachments. The Outlook user has the choice to select either method as per the requirement and combine multiple PST files in Outlook 2007, 2010, 2013, and 2016. Both the methods work fine and are tested under suitable conditions and apparatus. But as per expert recommendation, PST Merge is the better choice.